For those that are not familiar with oxtails, this is a cut of beef from the tail end. It's a cut that is especially great for slow cooking and braising until it falls off the bone. The Baron was new to this cut of beef and so it's taking him some time to understand it since he has aversions to meat on bones. Nonetheless, Joel and I loved this dish - and all things made with oxtail. 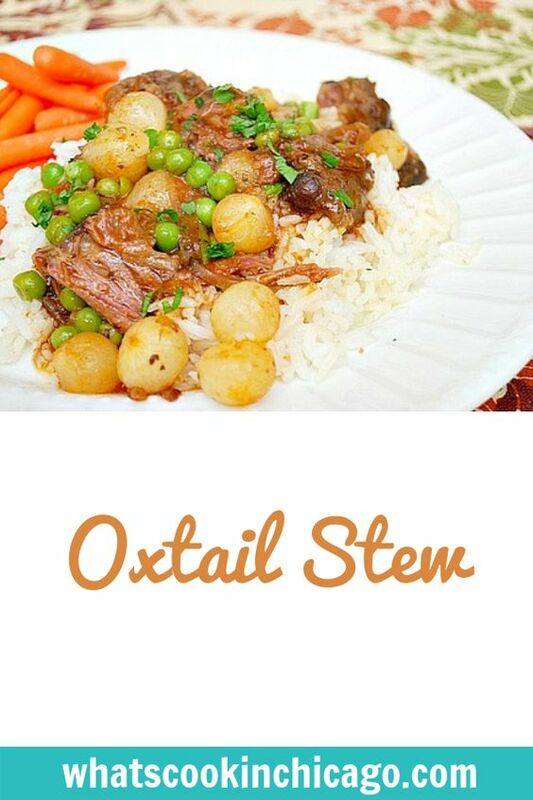 If you prefer, you can substitute the oxtail with beef stew meat for something similar... but it won't give off the same silky rich texture that oxtails do. 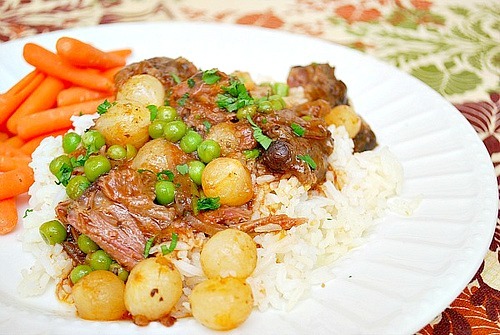 In the base of a slow cooker or crockpot, add oxtails, onions, scallions, garlic, thyme, red pepper, paprika, bay leaf, and hot sauce and marinate at least 4 hours or overnight in the refrigerator, stirring occasionally. Place the base into the slow cooker or crockpot. Add enough water to just cover the oxtails and cook on low for 6 hours, occasionally adding water to keep oxtails covered with liquid. After 6 hours and the oxtails have become tender, add the tomato paste, and 2 more cups of beef broth and water, if needed. Cook on high for another hour,, skimming fat off top and stirring occasionally. In the last 15 minutes of cook time, season with 2 tablespoons salt, add the peas and pearl onions and stir. Just before serving, remove oxtail from the bone - as it should naturally fall off from the long cooking. Serve over rice. My oxtail stew has never looked as lovely as this.